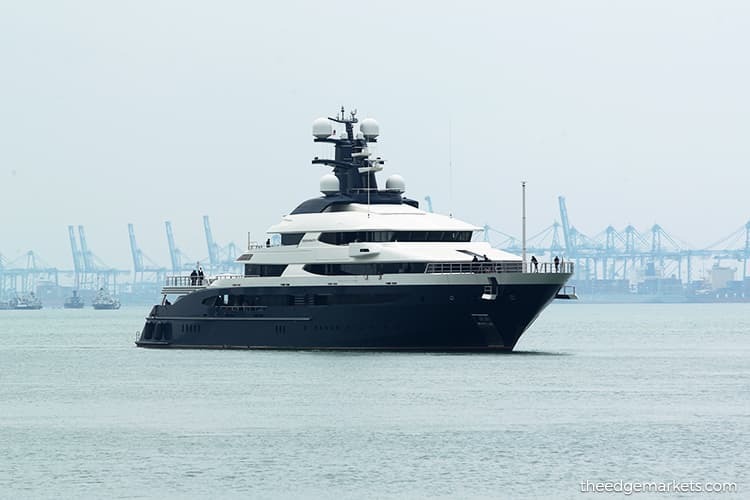 KUALA LUMPUR (Feb 12): Parties interested in buying the luxury superyacht Equanimity can now also approach the government and 1Malaysia Development Bhd (1MDB) besides the exclusive central agent Burgess, according to lawyer Jeremy Joseph. Joseph, who acts for the government as well as 1MDB and two of its subsidiaries, namely 1MDB Energy Holdings Limited and 1MDB Global Investment Limited, said, however, that Burgess still remained the exclusive central agent. "So, now they can come and negotiate with us (the government and 1MDB) directly. So, today’s hearing is to ensure that this order is given and clarified. They can come to Burgess and come to us directly. The idea is to maximise the potential purchase," he said when met by reporters after case management in chambers before Judicial Commissioner Datuk Khadijah Idris here today. The Equanimity, which belongs to the Malaysian government, is to be sold for no less than US$130 million (RM543 million), which is half of its original price. It is reportedly worth US$250 million (RM1 billion). On Aug 24, 2018, the Admiralty Court granted an application by the government, 1MDB as well as 1MDB Energy Holdings Limited and 1MDB Global Investment Limited to sell the superyacht. In the application filed on Aug 23, the four plaintiffs named the owner of the ship, Equanimity of Cayman Islands, as the defendant in the suit filed via the law firm of Jeremy Joseph & Partners. In the notice of application, the plaintiffs asked for the sale of the ship, bunkers, fuel, lubricants and other consumables on board to be conducted via public tender or private treaty by the Admiralty Court sheriff. The plaintiffs wanted the sheriff to receive bids or offers for the vessel and the bunkers and for the purchase price to be paid to the sheriff in US dollars or euros or ringgit. On Oct 19, 2018, the Admiralty Court declared that Equanimity belonged to the Malaysian government and 1MDB as the beneficiary owner when its registered owner failed to appear in court to claim the vessel and that the government could then sell the yacht. Then, on Oct 26, 2018, the same court approved the terms and conditions for the bidding process for the vessel to commence from Oct 29 until Nov 28. The Equanimity was bought by Malaysian businessman Low Taek Jho or Jho Low using money allegedly stolen from scandal-tainted 1MDB. The vessel was seized off Bali, Indonesia, in February last year at the request of the US authorities as part of the corruption investigation launched by the US Department of Justice (DoJ) into 1MDB. It was handed over to the Malaysian government and brought to Port Klang on Aug 7, 2018.